The Mage Ormus had disappeared, replaced by the Pharaoh Tutankhamun, whose face he had now taken. The ambience had become filled with mysterious fluids and invisible presences, and everyone felt transported to an epoch whose evocation appeared to be a ludicrous anachronism in that ultra-modern décor. In New York, the Mage Ormus, claiming to be the reincarnation of Tutankhamun, has gathered around him a coterie of disciples chosen amongst the world's wealthiest elite in order to relive the Mysteries of Ancient Egypt. One of them, the Duchess of Rutland, may well be the reincarnation of Am-Phaoli, the Pharaoh's wife. But is it all star-crossed love over the chasm of centuries, or an elaborate scheme by two conniving conmen aiming to steal the Duchess' fortune? 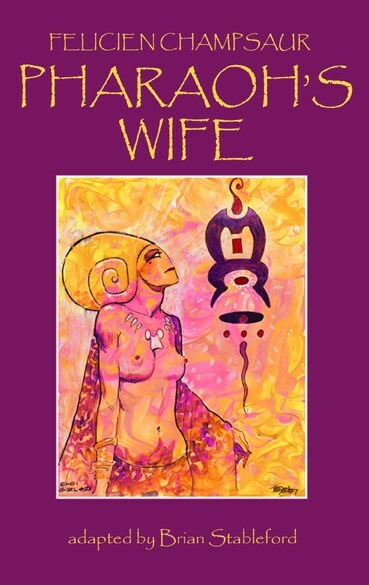 Pharaoh's Wife, subitled An Occult Novel (1929), is primarily a love story. Whether its heroine really is Tutankhamun's wife or not, what truly matters are the psychological effects that her belief in the notion of serial reincarnation might have on her attempt to find a purpose in life.